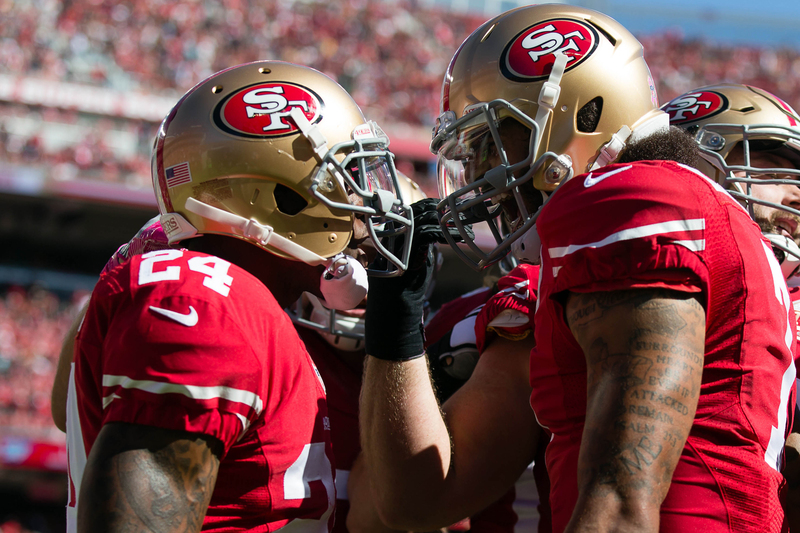 The San Francisco 49ers lost their sixth game of the season on Sunday. Quarterback Colin Kaepernick, author of the most stunning individual athletic protest since Olympians Tommy Smith and John Carlos, lost his second straight game as their starter. Kaepernick, to his great credit, has made the playing of the national anthem the most uncomfortable three minutes in America by refusing to stand and calling attention to the political, economic and judicial mistreatment of African-Americans. Kaepernick was outdueled on Sunday by another black quarterback, Tampa Bay Buccaneer Jameis Winston, who threw three touchdowns to Kaepernick’s one. But Winston isn’t doing any kneeling. 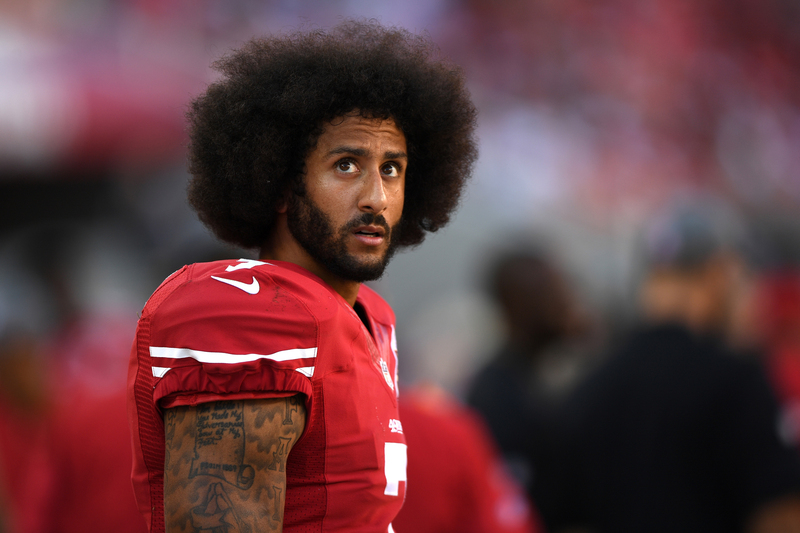 After the loss, Kaepernick was asked by The Undefeated what he thought about suggestions that he is partly to blame for the NFL’s declining TV ratings. The results of one survey showed that some viewers were protesting Kaepernick’s protests by not watching any games. (From left to right) Eric Reid (No. 35), Colin Kaepernick (No. 7) and Eli Harold (No. 58) of the San Francisco 49ers kneel in protest during the national anthem before their NFL game against the Tampa Bay Buccaneers at Levi’s Stadium on Oct. 23 in Santa Clara, California. Nonetheless, the 49ers are 1-6, and the fans were sparse Sunday. In an attention-deficit society like ours, interest in Kaepernick’s silent protest is in danger of being buried beneath World Series fervor and the start of a new NBA season. The answer is simple, though the execution is not. William C. Rhoden talks about his interview with 49ers QB Colin Kaepernick. “I don’t think it’s far out; ultimately, it’s something that takes time,” Kaepernick said. As he left Levi’s Stadium, Kaepernick and I had a brief but pointed discussion about these next steps. He talked about the need, beyond protest, for an initiative that attacks the structural racism that keeps African-Americans out of the sports industry’s lucrative economic ecosystem. Yes, there had to be viable candidates for corporate boards and viable vendors with whom the teams and companies could do business. But Kaepernick has hung out in the corridors of power enough to know that force and leverage are the names of the game. Nike, which has two African-Americans on its board, is the apparel company he’s under contract with. San Francisco 49ers running back Shaun Draughn (No. 24) celebrates with quarterback Colin Kaepernick (No. 7) after scoring a touchdown against the Tampa Bay Buccaneers during the first quarter at Levi’s Stadium. And he is one of the lucky ones. Like many of his colleagues who play professional athletics, Kaepernick grew up in challenging circumstances but became big enough, fast enough, strong enough — possessing enough skills — to catapult himself through an invisible cage of bias. He has landed in the general vicinity of the golden life, populated by communities of billionaire team owners and their associates. Many of them though, as well-meaning as they may be, do not see how to address the issues that Kaepernick and others have brought to light. Kneeling for the national anthem has certainly made ripples. But the next level of protest, especially for black athletes concentrated in professional football and basketball, is challenging teams and the companies with whom they do business to put more African-Americans on their corporate boards, to do a more robust business with black vendors. This is activism from the inside. Using visibility and leverage to participate in what John Rogers calls the “capitalist democracy” in a full way. Rogers is the founder and CEO of Ariel Capital Investments, the largest minority-run mutual fund firm in the United States. I’ve spoken with Rogers over the years about athletes and activism — he was the captain of Princeton’s Ivy League basketball championship team in 1979-80. We’ve recently spoken about Kaepernick and the rare opportunity this generation of black athletes has to make an economic impact on the communities from which many of them come. Rogers said that as sophisticated as he thought he was, he had no idea of the wealth passing back and forth before he got on corporate boards. 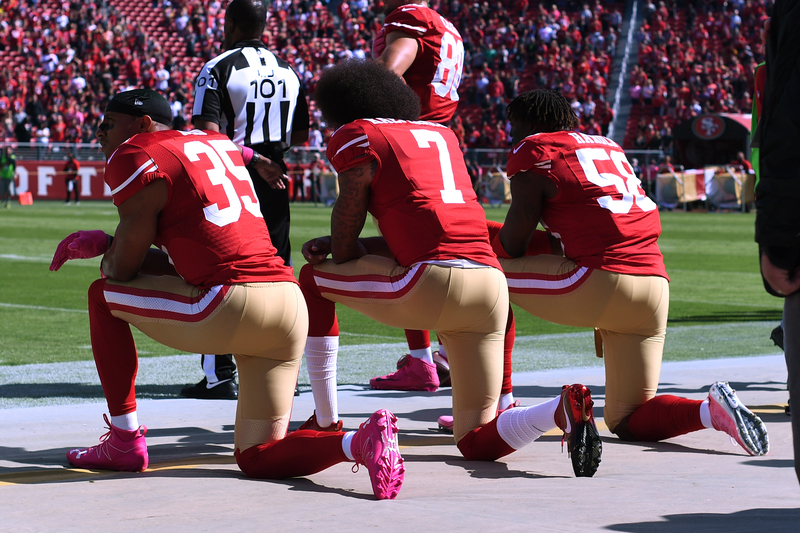 For high-profile, well-compensated athletes like Kaepernick, the first next step is to ask team executives and CEOs whether they are recruiting African-Americans for positions of leadership and influence within their organizations. Are they doing business with black vendors? Colin Kaepernick of the San Francisco 49ers looks on from the sidelines during their NFL game against the Tampa Bay Buccaneers at Levi’s Stadium on Oct. 23 in Santa Clara, California. These were the kind of questions Dr. Martin Luther King Jr. asked near the end of his life, the question Maynard Jackson asked when he was the mayor of Atlanta, the question Jesse Jackson asked when he took on the lack of diversity in Silicon Valley. “If Dr. King can ask the question, if Jesse Jackson can ask the question, if Maynard Jackson can ask the questions, athletes can and should ask the same questions,” Rogers said. Kaepernick has effectively used a silent gesture during the national anthem to remind the nation of its responsibility to live up to the commitment of fairness and inclusion. Now it’s time to carry the struggle into the boardroom, ask the tough questions and demand action.